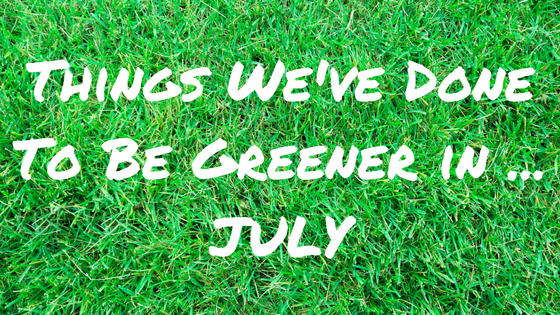 So Plastic Free July is over, did any of you take part? I have to admit I didn't - end of term overwhelm meant I didn't want to add any stress to my life! But my mission to live a more eco-friendly life continues. With a toddler and a six year old with sensory issues, we tend to throw away a lot of food that's been offered but not eaten. It really bugs me, but equally I know that forcing my kids to eat will only set them up for more issues down the line. So what's the solution? After coming to a point of despair with Girl Child's eating, I decided that actually, if she doesn't want a full meal at the end of the day, it's not the end of the world, especially when she's had a school dinner. So I started checking before I started cooking if she'd want the meal we were all eating, and if not she got sandwiches. And it did cut down on the amount of food we threw away very quickly. Actually, her passion for sandwiches was short lived and she mostly eats the same as us now, but I'm more conscious of how much I give her, making sure she doesn't get too much for her appetite. And I'm doing the same with Toddler, offering smaller portions. We're not totally food waste free, but it's made a huge difference just cooperating with Girl Child about what she eats and being more aware of what my kids can manage in a sitting. On a related note, in an effort to reduce the amount of packaging I throw away, I'm taking small steps towards cooking from scratch. And I mean small - I'm not a great cook and the kids just don't stay entertained while I'm cooking for long enough to do anything fancy. But even one meal a week where I don't use anything out of a packet can make a difference. For instance, we decided to have stir fry one weekend - usually I'd buy a pre-chopped stir fry mix, and maybe ready-made egg fried rice too. But this time I did it all from scratch (OK, bar the sauce - I need to find a good recipe). My egg fried rice may not have been as good as the shop bought stuff but at least it didn't come in a non-recyclable tub! Remember I mentioned going to a zero waste pop up shop a while back? Well they now have their own premises so we went for a visit. We didn't buy much - bicarb (hippy staple), dried fruit and nuts and a bamboo toothbrush (more on that in a minute) - but it gave us chance to scope out the other stock and think about what we can switch to next time. And yes, I've now got a bamboo toothbrush! At £4 it was a bit more expensive than my usual brushes but as long as it lasts three months that won't be a huge outlay per year. It brushes really well and leaves my teeth feeling very clean, but I think it'll take a long time to get used to the feeling of a wooden toothbrush in my mouth! I'm not sure the kids would be keen so I'll stick to just the adult ones for now. So that was July. August is going to be an interesting month in terms of trying to live green, as we're doing lots of travelling and I'll need to find ways to keep the kids busy without too much waste. Do you have any tips on staying eco-friendly during the school holidays?